of the formerly unidentified victim. On Wednesday 14 June 2017, members of the Anne Arundel County Police Department responded to a call reporting that a body had been found in the area of East Ordnance Road and East Avenue in Glen Burnie, MD. Upon arrival, officers located badly decomposed human skeletal remains that had been covered up by a tarp. The Office of the Chief Medical Examiner later determined that the decedent was a female approximately 20 years of age and that foul play was suspected in her death. 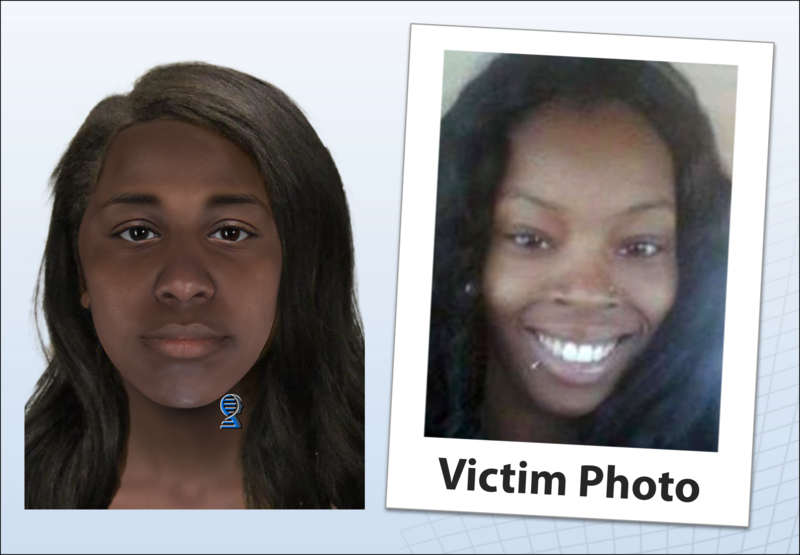 In the fall of 2017, after initial investigative efforts failed to reveal the victim's identity, Anne Arundel County Police contacted Parabon NanoLabs with a request to use the company's Snapshot DNA Phenotyping service to generate a likeness of the victim to assist with identification. "We had engaged Parabon on such cases in the past and felt it would be the most efficient way to get to a positive identification," said Anne Arundel County Police Detective Sgt. Rob Price. 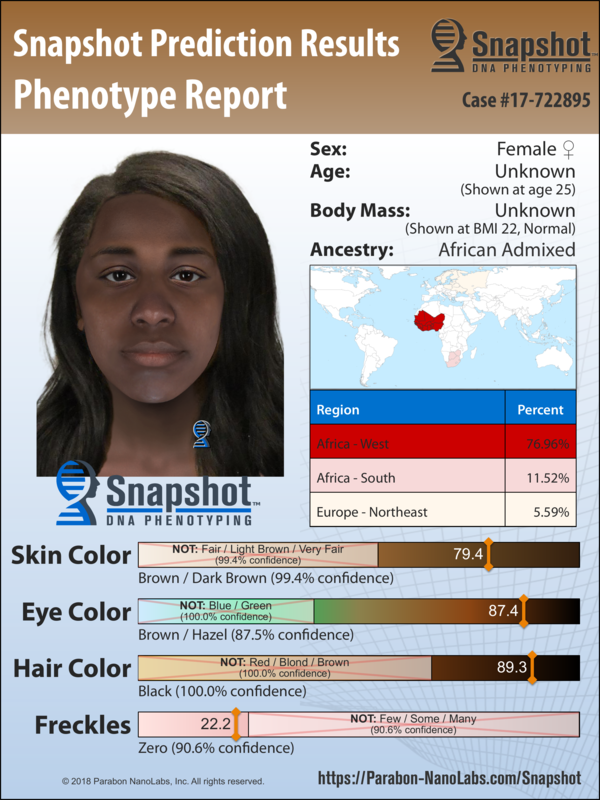 Snapshot's analysis of the DNA indicated the victim was of African American ancestry, with brown to dark brown skin, brown eyes, black hair, and no freckles. Thom Shaw, a certified forensic artist at Parabon, performed a facial reconstruction from the victim's skull and digitally combined it with the DNA predictions in order to generate an image of how the victim may have looked when she was alive. "The ability to fine tune a Snapshot composite with details from a skull gives a more fully-informed likeness of an unidentified victim," says Shaw. and a photograph of Shaquana Marie Caldwell. Anne Arundel County Police disseminated a bulletin to area law enforcement containing the Snapshot report and a description of clothing and jewelry found at the crime scene. Shortly thereafter, the Baltimore City Police Department contacted Sgt. Price and advised him there were several similarities between the Glen Burnie victim and a Baltimore missing person. Shaquana Caldwell, 26, was last seen on 14 May 2017 on Spruce Street near Fairhaven Avenue in South Baltimore's Brooklyn area, and was declared missing after family and friends had not seen her for several days thereafter. Baltimore medical examiners compared Caldwell's dental records to the deceased woman found in Glen Burnie, and on 13 November 2017 the unknown victim was positively identified as Shaquana Marie Caldwell. With this information, Baltimore Police began an investigation into Shaquana's death, which quickly led to the arrest of Taras Caldwell, her boyfriend (they share the same last name, but were not married). Shaquana's family had been suspicious of Caldwell, and indeed, he subsequently confessed to the murder. Baltimore Police reported that, during an argument, Taras Caldwell strangled Shaquana in an apartment in Baltimore and then disposed of her body in a wooded area in Glen Burnie. He was apprehended in Park City, Utah after violating his parole by leaving the state. Caldwell had been released on parole after serving 17 years of a 30-year sentence for the death of another woman in July 1998. After he was taken into custody in Baltimore, Taras Caldwell went with Baltimore city homicide detectives and FBI agents to the area where Shaquana Caldwell's body had been found. He confessed to the murder and was able to point out the exact location where he had left the body. Det. Price remarked, "This case provides a great example of the potential for DNA phenotyping to assist with the identification of skeletal remains." He added "Most of these unidentified individuals are victims of crime, and the investigations into their deaths cannot begin until we know who they are." Taras Caldwell is currently being held pending trial.